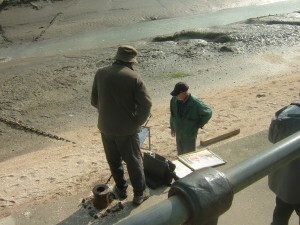 The February 2014 issue of Artists & Illustrators magazine contains a short article which examines the background and objectives of the group and features four Wappers (Edman O’Aivazian, Derek Daniells, Karl Terry and John Killens), who explain which sections of the Thames they find most inspiring. A few months ago the Wapping Group broke new ground when a team of French journalists interviewed and photographed some of them on location at Gillingham and Lower Halstow for the October-November issue (no. 112) of the magazine Pratique des Arts. The title of the article is ‘En virée [on location] avec le Wapping group’. Readers with reasonable French can enjoy an in-depth exploration of the planning, setting up and execution of ‘plein-air’ (and sometimes ‘pleine-pluie’ ) painting. The article is both informative and fully illustrated.